Diary A Note on the Apartheid Museum Well, obviously it is all our fault, we weren’t forceful enough with the Boers and we weren’t nice enough to the Blacks and then what do we do, we just get up and walk out leaving one hell of a mess to be sorted out….no one said we had to tidy up after the party! As you enter the Apartheid Museum through (in our case) the “whites only” entrance you are handed a a weighty tome with very, very small print entitled “The South African Constitution” I’m sorry, but a constitution should be no more than a page of A4 in BIG TYPE so even short sighted people can read it. This is maybe why Britain lacks a written constitution as the politicians are all too verbose and can’t express in 20000 words what it would take any “man on the Clapham omnibus” a mere grunt to express. Having a little time on my hands (but not as much as you’d expect) I’m going to start it off so Tony B etc can have a basic framework of a working document. Here goes:1) All people are equal 2) Try to be nice to others. 3) Respect small furry creatures and try not to squash them (This article added under coercion from Ella and Tess) 4)Government should only interfere with the individual as a totally, final last resort…and then it should think very, very carefully about it…possibly for many, many years. 5) People (except Sun readers) should be trusted as responsible adults. There we are, that covers about everything I think. If any government would like a constitution written for them, then feel free to ask my new company…”Constitutions R Us” I can do 2 for a tenner…there can’t say fairer than that can I. Anyway coming back to the museum, it does make you realise just what everyone had to put up with for many, many years. It is some sort of miracle that Nelson Mandela and F W de Klerk created in dismantling Apartheid in a relatively peaceful way. It is true that there is deep unhappiness with the result from the Whites, Blacks and Coloured, (the three classes of people under Apartheid), but as things stand South Africa functions where it could have all gone so terribly wrong. Good luck and I hope that when the god like Mandela dies the belief in the “Rainbow Nation” doesn’t die with him. All it would take is a South African Captain Bob (Zimbabwe) to wreck all the difficult work that has been done. 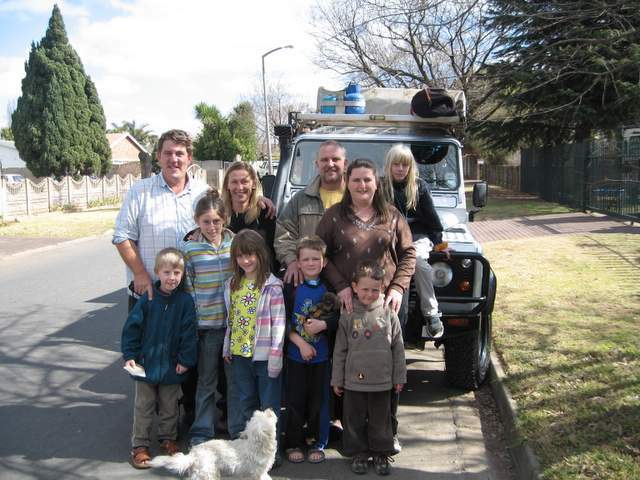 Stayed the last night with Grant, one of the mechanics at Land Rover East Rand. He sort of took pity on us as we were going to have to drive out of Jo’burg in the dark, at rush hour. We all went to the cinema in a mall to watch “Over The Hedge” and I must say we had a very nice “normal” kind of evening almost like we were back at home. Grant loves Land Rovers and his dream is to visit the LR factory to see the midgets swing from the ceiling beams as they attempt to put roofs on 110 Defenders. PIC SHOWS: WITH GRANT AND FAMILY.